Home » News » #News : Mark Zuckerberg Arrives In Lagos, Find Out His Purpose. #News : Mark Zuckerberg Arrives In Lagos, Find Out His Purpose. Facebook’s Founder and one of the world’s billionaires, Mark Zuckerberg is currently in Nigeria! The tech entrepreneur is currently at Co-Creation Hub (CcHub) in Yaba. 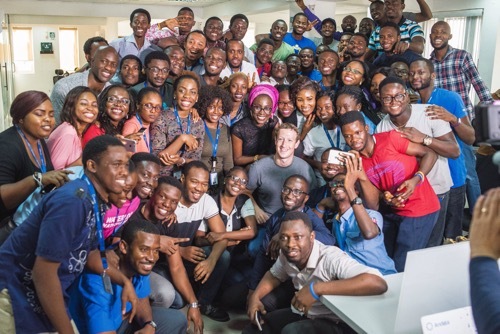 Mark Zuckerberg is visiting Nigeria this week on his first trip to Africa, using his time in the country to visit the Yaba technology hub in Lagos, meet with developers and partners, and explore Nollywood. Zuckerberg is in Nigeria to listen and learn and take ideas back to California on how Facebook can better support tech development and entrepreneurship across Africa. One of his first stops on the trip was to visit a ‘Summer of Code Camp’ at the Co-Creation Hub (CcHub) in Yaba, known as the Silicon Valley of Nigeria. CcHub opened in 2011 and at the time didn’t even have an office. Five years later they fill three floors and the roof of a building. At CcHub people can learn how to code, developers can get help launching their first products, and find mentors and funding. At CcHub Zuckerberg met with developers like Temi Giwa, who runs a platform called Life Bank that makes blood available when and where it is needed in Nigeria. Life Bank saves lives by mobilizing blood donations, taking inventory of all blood available in the country, and delivering blood in the right condition to where it is needed. “This is my first trip to sub-Saharan Africa. I’ll be meeting with developers and entrepreneurs, and learning about the startup ecosystem in Nigeria. The energy here is amazing and I’m excited to learn as much as I can. Mark then went to Andela, an engineering organization that is building the next generation of technical leaders in Africa. Andela is a business that recruits the most talented technologists in Africa and shapes them into world-class developers through a four-year technical leadership program. In the two years since it was founded, Andela has accepted just over 200 engineers from a pool of more than 40,000 applicants. Andela developers spend six months mastering a technical stack and contributing to open source projects before being placed with global technology companies as full-time, distributed teammates, working out of Andela headquarters in Lagos and Nairobi. Earlier this year, the Chan Zuckerberg Initiative invested in Andela after being impressed by the company’s innovative model of learning and its drive to connect the global technology ecosystem with the most talented developers in Africa. At the end of the day Zuckerberg stopped by an Express WiFi stand in Lagos owned by Rosemary Njoku. Facebook’s Express WiFi lets entrepreneurs like Rosemary set up a hot spot to help their community access apps and services built by local developers.